Double the number of hits for each attack (power is reduced by 50% per hit but gain power increase for each skill level) for 1 turn. Removes all buffs from target. Increases NP Damage by 30%.&lt*br/&gt*Grants unit immunity to debuffs 3 times. A swordsman from the early Edo period, famous for being the greatest master of the blade in Japanese history. 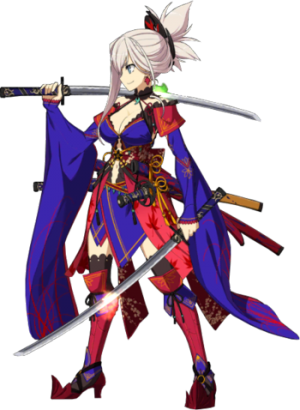 Musashi is said to have created "Niten Ichiryu," and was a master of the two-sword style that used both short and long swords. ...Or so it was thought, but it seems that this Musashi is different from the one known in the history textbooks. "Eh? Musashi's a guy in this world? And super-famous? Wow!" ...The flower at the apex of heaven is splendid in color. Her blade reaches the heights of true nothingness. In proper history, she was born in Oohara, Sakushu, which is now part of Mimasaka City in Okayama Prefecture. She was born in the year 1584. Her father was an instructor of martial arts who served the Shinmen clan, the lords of Takayama castle. The Shinmen clan granted him the right to use the Shinmen name, and so he called himself Shinmen Munisai. Shinmen Munisai had a dojo that taught the use of the jitte in Miyamoto village in Yoshinosato, which became Musashi's homeland. 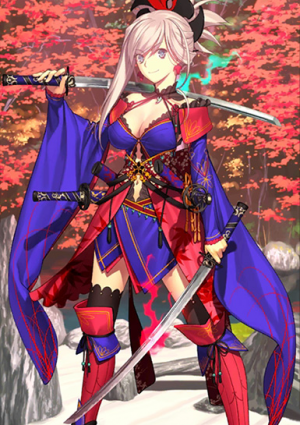 For this reason, she calls herself Miyamoto Musashi. She would later go on to leave behind many legends, especially during her twenties, when she fought many other warriors. To this day, these great duels are a staple of entertainment. However, the truth about most of the episodes that took place during the decade of her twenties is unknown, and many of them are believed to be fictional. 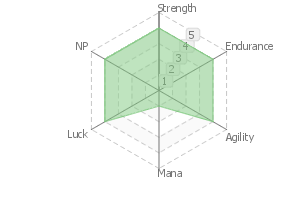 A female swordmaster who is bright, cheerful, and dignified, yet vibrant. She always has a grin on her face like she's in total control, but she does not look down on her opponents. She is just enjoying life. She just laughs at most of life's problems, but deep down, she is a woman who strives to master the path of the blade. For this reason, she can be restrained and tough on others when it comes to taking lives. That aside, she falls in love easily, and loves it when people rely on her. She also loves compliments and is easily swayed by flattery. A woman who loves a good fight, she has a strong sense ofjustice, but never boasts about it. She's normally an easygoing wanderer, but in the face of a one-sided slaughter, someone who is toying with people's pride or beliefs for entertainment, or in the case of stealing her food when she is hungry, she becomes an unstoppable foe. Heavenly Eye is said to be the power to achieve one's goals. lt's an act of resolve to do something, then putting your entire body and soul into achieving it. One could say that it's an act of putting your entire self and existence into your gaze, and projecting it towards your goal. 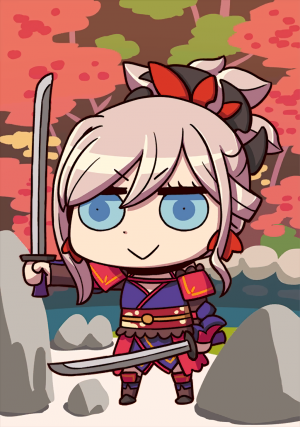 In Musashi's case, Heavenly Eye is used only to wield her blade on the spot. For example, if she decides to cut her opponent's right arm, she'll do whatever it takes to sever it. Her strike will be optimized, bending time and space toward achieving this goal. The power to narrow down all potential options for achieving a goal into a single eventuality. It could also be described as a very special type of Mystic Eye, which narrows an infinite number of possible futures down to only one. The highest level a swordsman can attain. The ultimate mental state. Corresponds to Suigetsu of Yagyu Shinkageryu. To become nothingness makes her invincible. Only a swordsman who has reached the infinite mental state can achieve this. A book written by Musashi just before her death, detailing the techniques she had mastered in life and the mental states she had achieved. lt is divided into five books: Earth, Water, Fire, Wind, and Void, and is the culmination of everything that is Musashi. The Book of Earth serves as a general introduction to the Niten Ichiryu. The Book of Water introduces specific techniques. The Book of Fire speaks of the art of war in terms of strategy and tactics. The Book of Wind discusses the flaws with certain tactics and techniques, so that a fundamental understanding of Niten Ichiryu will appear of its own volition in the reader's mind. The final Book of the Void contains Musashi's understanding of the concept of emptiness, written as a technique called "contrast." A swordsman from the early Edo Period, famous as the strongest swordmaster in Japanese history. Learned in the “Niten Ichi-ryu”, a school that was supposedly founded by Musashi, an expert of “dual wielding” that employs a long sword and a short sword. 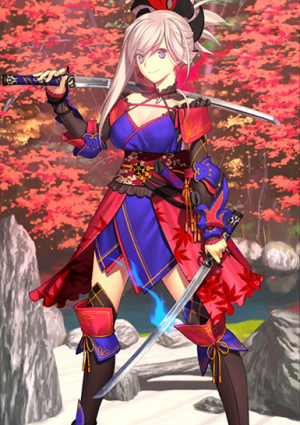 ... Or so it should have been, but seems that her circumstances are somehow different from the Musashi that left his name in history. “Eh? The ‘Musashi’ in this world is a man? As you see, the person herself has a relaxed, open attitude, and she never gets worked up. Having no particular interest in victory or prestige, yet slovenly with alcohol, a sucker for money and weak against free food. ---a vibrant flower of tengen(1). Her sword reaches the heights of nothingness. In the proper history, Musashi was born in Oohara, Sakushu (modern day Mimasaka, in the Okayama prefecture), at 1584. His father was a practitioner of martial arts named Shinmen Munisai, who served as an instructor of martial arts to the Shinmen House of lords of the Takayama Castle, and who received the name of Shinmen from his employer’s family. Shinmen Munisai built a dojo of jutte techniques in the Miyamoto village of the Yoshino district, and Musashi would later call himself “Miyamoto” due having this land as his hometown. He left behind many anecdotes and went through numerous battles against martial artists upon reaching adulthood - especially during the ten years of his 20s. Those famous bouts are even now seen as a staple of the entertainment industry. However, the truth behind the episodes of these ten years of battle is mostly wrapped in mystery and there are strong suspicions about them being mere fiction. 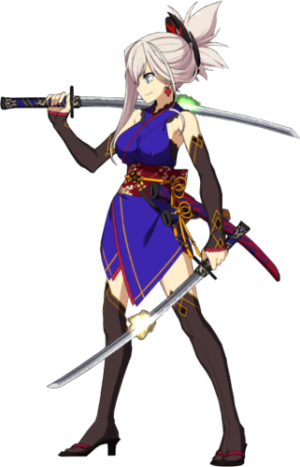 Cheerful and openhearted, a female swordsman that is lively yet dignified. Constantly full of pride, acting complacently, but that does not mean she is looking down on her opponent. She is merely enjoying life. Her way of expressing emotions is somewhat great. She greatly laughs and gets greatly surprised. 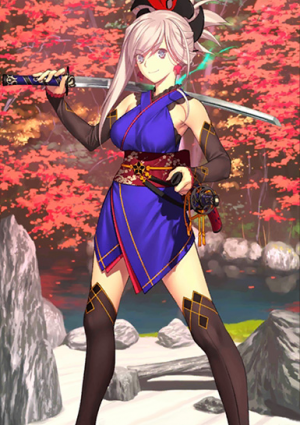 While she has a broad-minded personality that laughs off at most things, due being “someone who masters the way of the sword” at her roots, she is very dry and severe in regards to the taking of lives. That being said, she falls in love easily and likes to be depended on very much. She also likes to be praised very much. Weak to flattery. A banchou disposition that loves a brawl. Although she has a sense of justice, she never preaches to be righteous herself. Fundamentally a carefree wandering vagabond, but she becomes ruthless when coming across scenes such as “an one-sided massacre”, “trampling on people’s dignity, convictions for fun” or “stealing my food when I’m hungry”. Heavenly Eye is regarded as “the power to accomplish an objective”. Once she has decided to do something, she will devote her body and soul to its fulfillment and achieve it without fail. You might say that this is something that she places her entire existence on her gaze and projects it onto her objective. 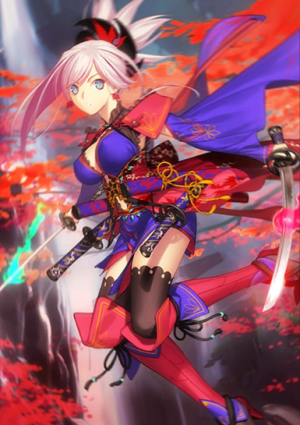 In Musashi’s case, her Heavenly Eye is pointed only at the deed of “cutting a certain place”. For example, once she has decided to “cut the opponent’s right arm”, she will server said right arm by taking all and every measures. 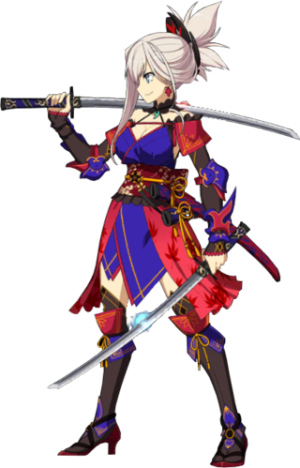 As a result, her attack becomes the optimal answer for a slash - “a sword stroke without anything pointless, which makes even time and space yield”. A power to take all the “measures for the sake of achieving an objective” and “narrowing them down to one”. You might as well say that this is an extremely unique set of mystic eyes, which confines the naturally infinite futures into “just a single” result. The highest order a swordsman can attain. The ultimate mental state. It corresponds to the concept of suigetsu(2) of the Yagyuu Shinkage-ryu. One is nothing, thus invincible. Only a swordsman who has reached the infinite mental state can perceive this. Right before death, Musashi compiled the mental state he attained during his lifetime, his cultivated techniques, into one book. Divided into the five volumes of Earth, Water, Fire, Wind and Void, this book was the culmination of the human being called “Musashi”. The Book of Five Rings gives an outline of the Niten Ichi-ryu and explains its ideology as an art of war in the Book of Earth, explains concrete techniques on the Book of Water, talks about the art of war in the dimensions of tactics and strategy, and - just like the above-mentioned - explains the fundamental understanding of the Niten Ichi-ryu by means of a repudiation of other schools. Finally, it has been said that Musashi’s own understanding about “emptiness”, as well as the above-mentioned technique of “confrontation”, has been written down on the Book of Void. (1): roughly, center of heaven. In ancient Chinese cosmology, the tengen was the source from which all creation grew from, the “vitality of heavens”. (2): moon on the water. In a broad way, this is a notion that a master warrior can easily perceive his opponent’s intentions so long he maintains a calm state of mind, but not so much when he is agitated. Just like the reflection of the moon on the water. This page was last modified on 3 January 2019, at 17:43.